Poor Mojo's Classic Rant: Pamela_Blackmon "Dumped by Boyfriend--Selling his Tool"
This tape measure doesn't exactly belong to me, however according to our legal system, possession is nine-tenths of the law. Please allow me to explain . . . This tape measure belongs to a guy I was dating for a few months before he fell off the face of the earth. He had commitment issues, emotional limitations, and appeared to be severely insecure. He was bad for me but I was enticed by his wit, charm and muscles. Hey, we all date the wrong people sometimes, what can I say. The rat mistakenly left it on my car as a joke (long story). It was supposed to be cute at the time, but now that I think about it, just to look at it, makes me want to measure the time I invested on this guy, and beat my head against the wall. I'm depressed at the fact that I have been officially "dumped". I feel as though if I can auction this testosterone laden man object, and get it out of my sight, I could have a fabulous time at the Mall with whatever money I can get for it. So please help a cute (and now unattached) girl regain some self respect, and closure on this deadbeat that dumped me by bidding on this TAPE MEASURE TOOL and taking it off my hands. 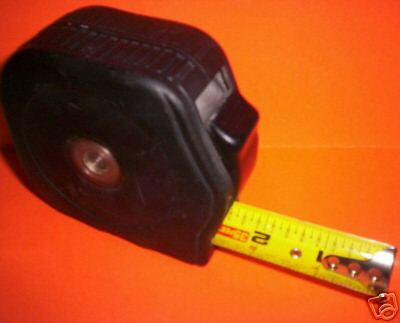 This Tape Measure is 35 feet, 3-1/2 inch (see photos). I guess it's industrial size because I compared them on Ebay, and as you can see, it's not a lightweight novelty tape measure...it's the very Heavy Duty kind. It's missing the label on the outside of it and, of course, it's been used....by a grifter that has no respect for the woman he dated! But it works just great like brandy new. I pulled it out the entire 35 feet...while cursing him...and it retracts right back in...like I'm gonna do. The button also holds it in place like it's supposed to...not that he pushed any of the right buttons! It appears to be a Stanley Brand....I sure would like to brand him! It also has a clip on one side to hang from your manly belt. Shipping on this sucker will be a flat 5 bucks ($5.00) to anywhere in the US. I will accept Paypal only as I don't want to be ripped off by another person this week, since I've already been emotionally torn apart from wasting my time with a loser. I'm upset and need to go shoe shopping....Please, PLEASE help a nice, but bitter girl get rid of the memories from a measurable broken heart by bidding on this item. Intelligent, funny, enthusiastic, passionate, optimistic and eager...to get rid of this constant reminder that I've made yet another bad choice in my life. Thank you for bidding and if you have any questions at all, please feel free to inch your way over to my dimension and ask.